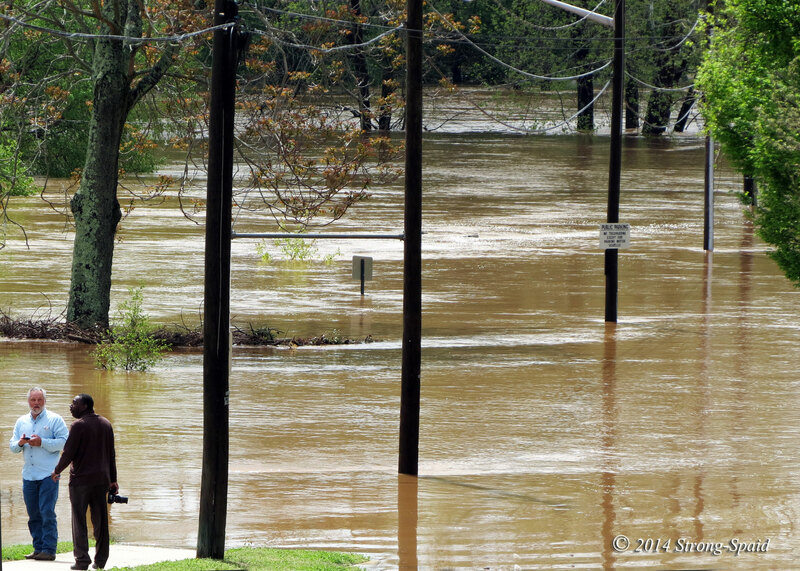 Because of 3 days of torrential spring rain in Fredericksburg, Virginia and surrounding areas, the Rappahannock River began to rise and spill over its banks. Undoubtedly, those who own houses and businesses nearest to the river were watching anxiously as the water crept higher and higher. 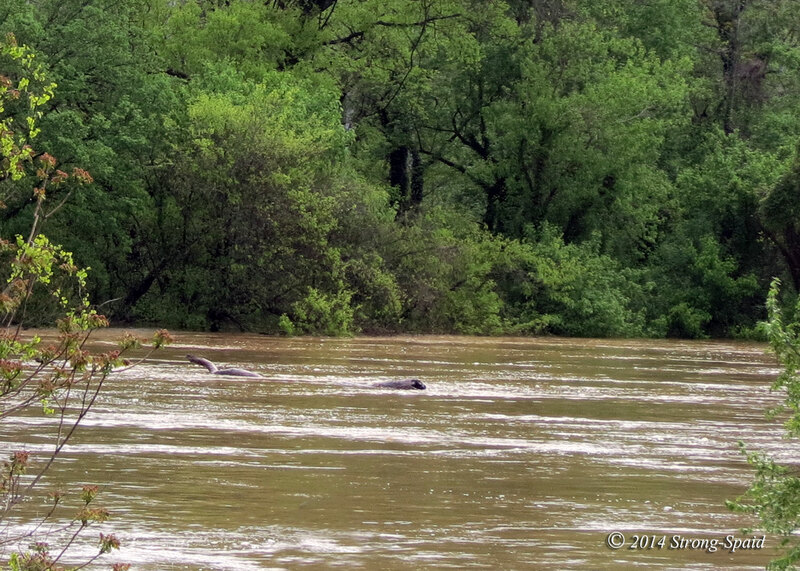 When I went down to see the river on May 1st, it had crested at 22 feet (the flood stage at Fredericksburg City Dock is 13 feet). 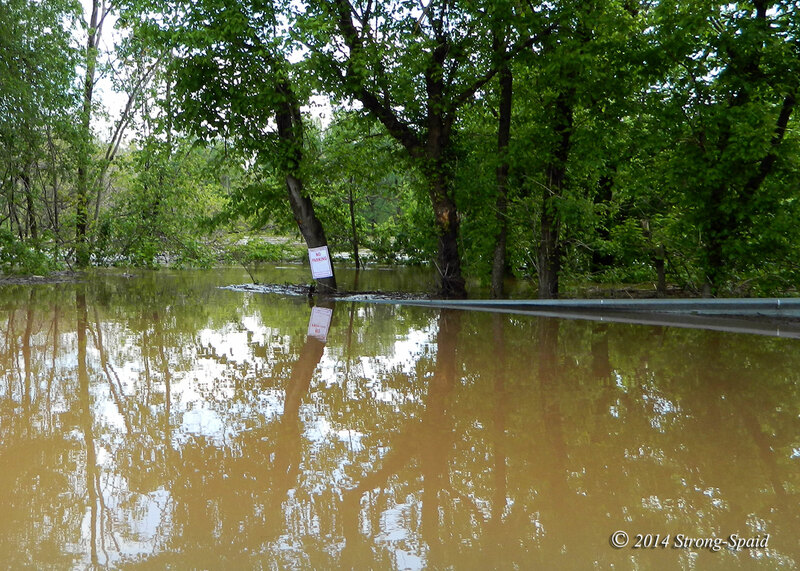 Even though it was early morning, a few people were already there taking pictures of the flood. Almost unbelievable! Back in January, 2013—I posted some photos of the City Dock in my story “Snow Cold Feet,” but today I did not recognize the area at all. I know that somewhere in this general vicinity beneath the muddy water, there is still a road, a parking lot, and a dock. Where all these things are located now, I’m not sure. The landscape looks totally different. A policeman (standing guard over the area) said that several “adventurous” people had come with intentions of canoeing on the fast-moving river. In no uncertain terms, they were told to go home. It would be incredibly foolish to take a canoe out on a raging river with floating hazards such as trees, logs, branches, and who knows what else unseen below. It’s true. Many of us dream of owning waterfront property, even though houses built close to water are subject to flooding. We know that Mother Nature can reclaim whatever she wants, whenever she wants; but we still take the chance, build, and optimistically hope for the best. Why? Because it is so relaxing to look out of a window and see another beautiful day reflected on water. Think twice! Odds are, next to an unpredictable river, a quiet waterfront home will eventually become a muddy water-inside home. Looking at the photos below, I would say that this is the epitome of stress! Luckily—there is no more rain predicted for today, and the weekend is supposed to be sunny and clear. 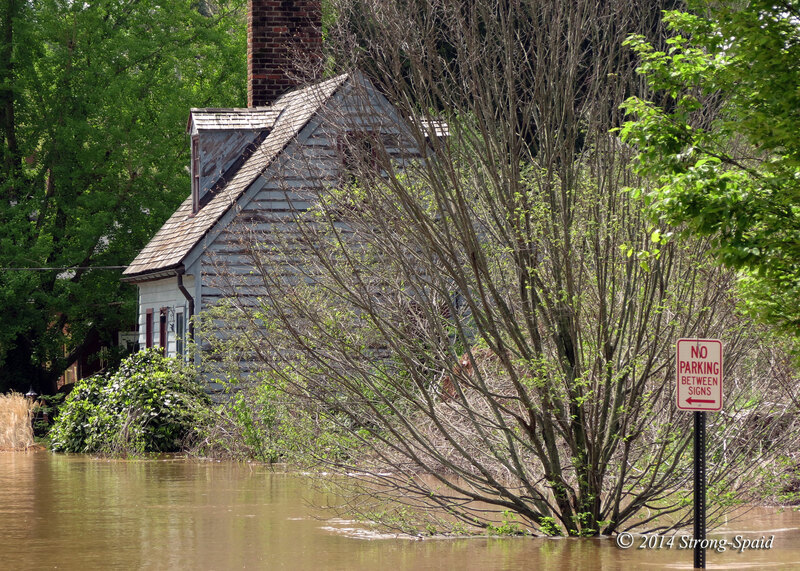 Soon the Rappahannock river will begin to recede, so houses and trees that do not belong in the water will be able to stand on solid ground once again. 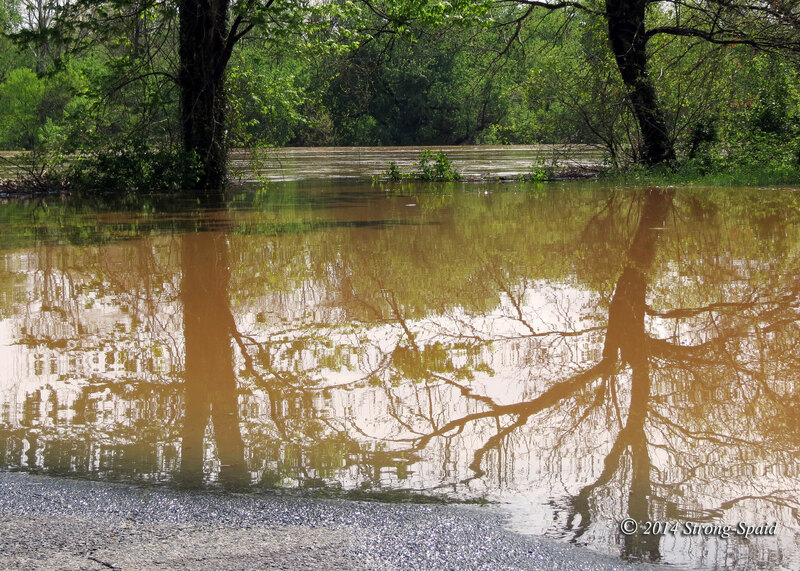 This entry was posted in Nature, Photo Essay, photography, River and tagged Flood, Fredericksburg Virginia, Rappahannock River, Water. Bookmark the permalink. It looks interesting on the pictures but for people who suffered from flood it is terrible experience. People who have lived in the historic district of Fredericskburg for a long time say this flood was not as bad as some previous floods on record. Knowing its history, people who have homes and businesses right on the Rappahannock river–have great respect for the water and its power. Living on the river is a risk many are willing to take, and they know exactly what to do when they see the river rising! “…..Hurricane Agnes blew in on June 21, 1972 and brought the second worst flood in Fredericksburg’s history. 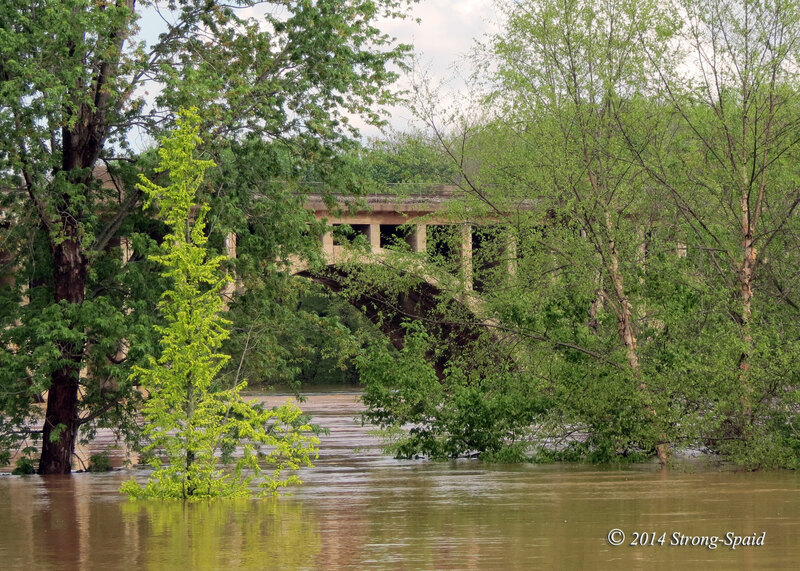 The water level was 39.1 feet above normal, and President Nixon declared Fredericksburg a disaster area. Hurricane Fran (Sept. 6, 1996) was our fifth worst flood since 1889. On April 26, 1937, the water level rose 39.1 feet above its normal level. This flood destroyed the steel Free Bridge. Its modern replacement is called the Chatham Bridge. Sympathies to those that suffer through such damage. Luckily, floods like this don’t happen around here that often. Down by the city dock, the Rappahannock river is usually calm and stunningly beautiful, which is probably why many people are willing to risk living so close to the river. There are a few restaurants that have outdoor seating overlooking the water, which attracts quite a few customers (including me). The pros and cons of living near the water have to be carefully considered, I guess. Problem is, one never knows exactly what the irascible Mother Nature is going to do!! I too would love to live within view of water, of any kind but yes, the risks are there. There is a river at the back of our property, beyond the yard, beyond the field and at the back of the woods – not at all visible, or even easily reachable. 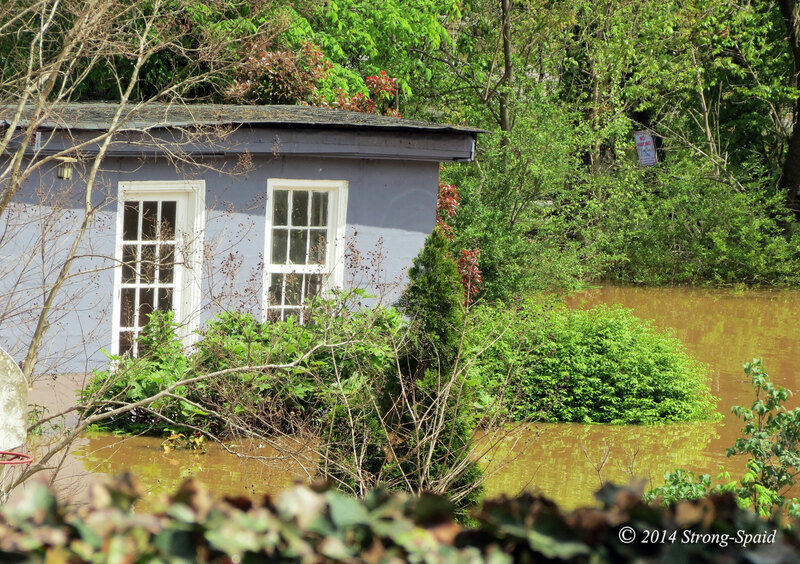 Each spring it floods the surrounding fields – no one lives within its flood plain though. Bylaws really should restrict building in areas exposed to reasonable risk and expectation of Mother Nature’s wrath. Thanks Pat and Tom. I know that you enjoyed visiting your son and his family. And you, luckily, live in a higher place that does not flood! Wow, that’s quite a thing to deal with. 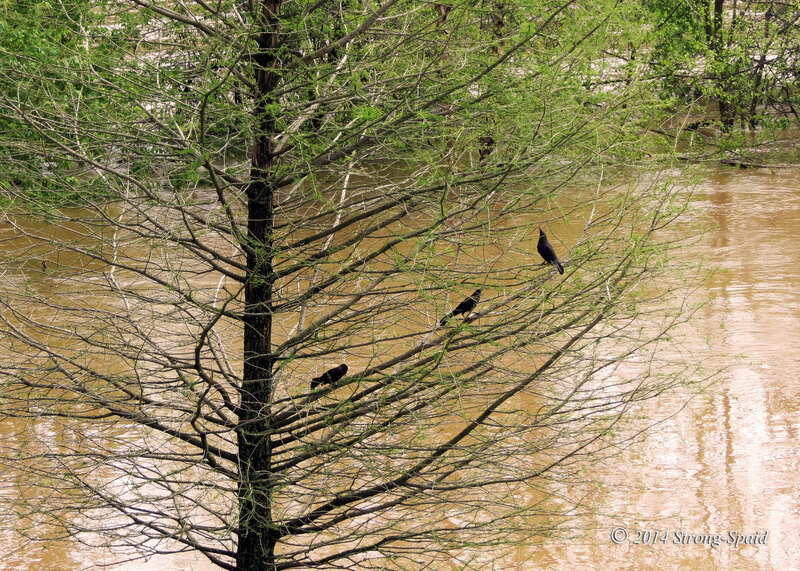 hope rain will stop and water will subside… it is tough for those who live in those places. really tough! Thanks. The rain did stop and the water level did go back to normal. I think, if I had a house so close to the river, I would sell it and move to higher ground. Some people don’t mind taking the chance…but…I am not that brave! Hi this is Gee, I am in the process of buying a house about 300 feet from the river on a hill is this very close or should I reconsider? I don’t really like being close to the river. Thanks. I don’t know. 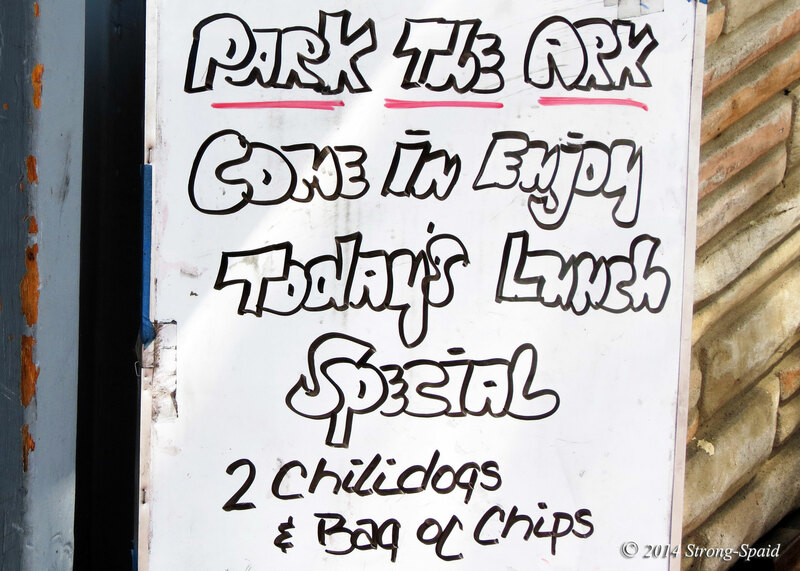 Probably best to talk to others who live along the river…….. Living by a river is a beautiful but treacherous experience. My prayers for all those who lost their lives, suffering, and lost all their memories. Poignant post. Sorry I have taken so long to respond. I recently moved and everything in my life suddenly turned inside out, upside down, and backwards!